Did you know that there are different types of Long Term Disability (LTD) coverage in Ontario? Four types, to be specific. Their purpose is to replace income lost by an individual due to illness or injury that prevents them from working. LTD benefits usually take effect four to six months after your injury or illness occurred. They are usually paid for up to two years but can be extended to the age of 65 (retirement) if you are unable to perform any work in any reasonable occupational capacity. The following types of LTD coverage are all unique, but their basic function – to protect you against lost income that would prevent your from paying your expenses due to your long term disability – is the same and they often operate in tandem with one another. WSIB provides government insurance that is paid into by all employers. It is intended for employees who have been injured in the workplace. Specifically, Loss of Earning (LOE) benefits are intended to replace income lost due to illness or injury incurred on the job. LOE benefits begin the next working day after your illness or injury occurred and will continue until you recover, no longer have a loss of income or turn 65. Benefits paid are based on your annual wage ceiling. WSIB benefits are a no-fault type of insurance. This means that, in receiving WSIB benefits, you forfeit your right to file a lawsuit against your employer for your injury. This form of LTD coverage is for individuals who are disabled and aren’t able to enter the workforce or are in significant financial need at the time they become disabled. Income support from the ODSP is intended to help those with disabilities in financial need to pay for food, housing and other living expenses. Therefore, proof of financial need is required before coverage is provided. employment incentives and benefits (i.e. aid with child care expenses). 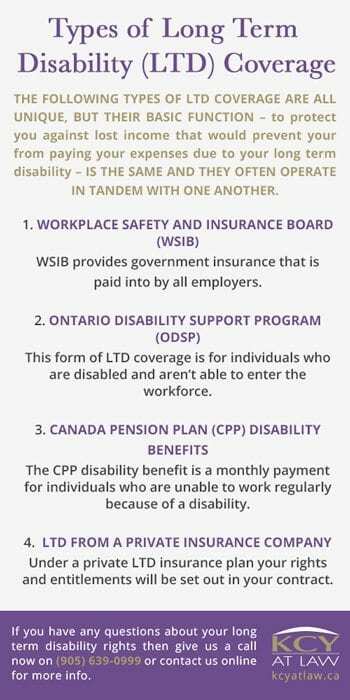 The CPP disability benefit is a monthly payment for individuals who are unable to work regularly because of a disability. The taxable payment is available to individuals who have contributed to the Canada Pension Plan in the past. How much you receive is largely based on what you have already contributed to the plan. As a CPP Disability Benefit recipient, each month you will receive $471.43 plus an amount based on your prior contributions during your working career. In 2016, the average monthly CPP disability benefit was $933.82. Under a private LTD insurance plan your rights and entitlements will be set out in your contract. There is huge variability in what you can receive and the requirements for receiving it. It is common for private insurers to insist that you apply for CPP Disability Benefits to offset the costs of their payments to you. Whatever you receive from CPP will be subtracted from the amount they give you each month. The right not to undergo unnecessary medical examinations. 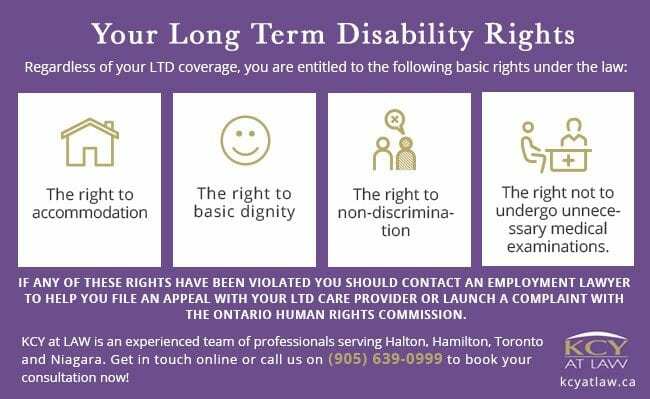 If any of these rights have been violated you should contact an employment lawyer to help you file an appeal with your LTD care provider or launch a complaint with the Ontario Human Rights Commission. KCY at LAW is an experienced team of professionals serving Halton, Hamilton, Toronto and Niagara. Get in touch online or call us to book your consultation (905) 639-0999. Temporary Layoffs – Guide For Employers & Employees Guide To Bonus Packages: Discretionary Bonus or Not?